Really awesome. So awesome, in fact, that it’s kind of having a moment (not that the ancient quaff was ever out of style). Wine drinking is on the rise, particularly among millennials, according to Wine Market Council’s 2015 study. What can I say? There’s just something about keeping it classy while you turn up. Or down, with (free!) Netflix, takeout dinner and an early bedtime. I may be bad at being a millennial, you guys. Although having wine — any wine — is almost always preferable to not, there is such a thing as bad wine. And few experiences are more disappointing than popping a brand-new bottle only to discover its contents don’t quite meet your expectations. Since most of us know little more than a few common varietals (read: types of grapes), buying wine can be a complete gamble. I was definitely guilty of using the “Who has the cutest label?” metric to make my purchasing decisions before I studied up. And unfortunately for us penny-hoarding types, the likelihood of buying a bad wine increases as the cost of the bottle decreases. While exceptions exist, it’s much harder to accidentally buy a dud when you’re spending $40 as opposed to $4. But luckily, some fairly simple rules can dramatically increase your chances of buying a good, cheap wine. First things first: What’s an appellation? Simply stated, an appellation tells you where a wine comes from. In some cases, it’s interchangeable with the name of the wine itself — Champagne, for instance, is both a place in France and what we call the sparkling wine it produces. In other cases, it’s simply a description of where a wine was grown, as in the case of Napa Valley cabernet sauvignon. These geographical indications are legally regulated, and different authorities have different rules in place to make sure what’s on the label matches what’s in the bottle. For example, an American wine is allowed to use a county and/or state appellation (e.g., Yamhill-Carlton, Oregon) if 75% or more of the grapes in the bottle were grown there — except in California, which requires 100%. Regardless, here’s the takeaway: The better the wine, the more specific its appellation. The grapes in “California” wine could be from anywhere (and everywhere) in the state, whereas a Monterey, California wine was all grown in a relatively small area. It might not seem like it makes that much of a difference, but the quality of a wine has everything to do with climate, soil and other geographically mediated factors. If two-thirds of the bottle you’re drinking is made with a cheaply grown filler grape, you’re going to taste it. The same goes for wine that’s simply “French” or “Spanish,” rather than from, say, Languedoc or Rioja. The more specific a wine is in naming its origin, the better shot you have of buying something you’ll really enjoy. These wines don’t feature a varietal label because they’re a blend of different grapes. Instead of creating single-varietal wines, vintners in these regions choose the grapes that best thrive in a given area, and thus demonstrate that area’s unique characteristics — a concept known in the wine community as terroir. So obviously, blends aren’t always bad. But when you’re looking at a $10 bottle, the odds are not in your favor. That’s because instead of carefully choosing a harmonious blend of grapes, many mass-production vintners instead simply use the leftover juices from whatever grapes they’re making into single-varietal wines that year. Not enough left for a whole case of merlot? No problem — just throw it in with whatever else is left over and slap an interesting-looking label on it. Boom: Profit. For the wine equivalent of that throw-every-leftover-in-the-same-pot dinner you dreaded from your childhood. To avoid this fate, steer clear of blends that cost $10 or less. Good blends will generally cost at least $15, and will usually list which grapes are included — sometimes even with percentages. Just remember: If the winemaker doesn’t want you to know what’s in the bottle, it’s probably not a good sign. Don’t misunderstand me: Good Bordeaux is life-changing. It can also cost $1,000 a bottle — or much, much more. While it’s possible to find relatively affordable wines from such a famous region, even these tend to cost closer to $50 than $15. Since winemakers know most consumers know the word “Bordeaux” (but little else), they’ll slap it on a wine made in outlying-but-still-technically-in-the-area villages whose vineyards don’t come anywhere near the quality of the stuff you think you’re getting. The same goes for Burgundy and other ultra-famous, old-world regions. So what’s a savvy wine shopper to do? Take a trip to the new world, instead. New world wines are, as the name suggests, ones produced in regions that are relatively new to winemaking — like South America, Australia, New Zealand and Africa, to name a few. Since they aren’t incredibly famous (yet), and since they started production with updated, more cost-effective winemaking tech, these regions often offer great value for a bottle. Poke fun as much as you want, but screw caps aren’t a dead giveaway for bad wine. In fact, they may actually be a better way to seal wine. Contaminants like TCA — the stuff people are talking about when they say a wine is “corked” — have a much harder time making their way through a metal screw cap than a porous cork. It’s also cheaper. Win-win, right? While some ultra-cheap, screw-capped wines will fall into the “less than pleasant” category, many are high-quality — especially new-world wines like the ones I mention above. Furthermore, a great many terrible wines come bottled under cork. So don’t pass it up just because of how it’s bottled! Besides, there’s another, even better benefit to the screw cap: easy access. You can probably find a better white than red on the cheap. This is a disappointment for me, because I’m almost exclusively a red drinker. But in general, you have to pay more for a good cabernet sauvignon than you do for, say, a good pinot grigio. That’s because most red wines take more time — and money — to get right. They’re a lot more likely to require aging in oak barrels, for example. So if you want to spend the least for the best-quality wine, giving up your taste for tannins might go a long way. These are the two most popular and well-known grape varietals in the U.S., so it’s easy for vendors to sell them at a markup, even if they’re not the best-quality product. These varietals also fare much better with a decent amount of vintner attention and aging, which means high-quality versions will come at a steeper price — and that slapped-together $10 bottle might not exactly shine. Instead, be adventurous and try a new varietal. Tempranillo, syrah, chenin blanc, viognier… There’s a whole world of wine out there you might be missing out on! Who knows? Maybe you’ve yet to taste your favorite grape. Bet you didn’t know that Costco is the largest wine retailer in the country. And for good reason: Although the selection isn’t huge, it’s well-curated, and the prices are very good — a lot better than you’d find at your local liquor store. Better yet? In some states, your right to buy wine without joining a warehouse club is protected by law, which means you could cash in on Costco’s low prices without even paying the membership fee. California makes the list, as do Arizona, Connecticut, Delaware, Hawaii, Indiana, Massachusetts, Michigan, Minnesota, New York and Texas, according to Consumerist. That said, the front-door clerk might not be in on this little secret… so be prepared to stand your ground and ask to see a manager to get the perk. Yes, even if you’re a broke college student. Sorry. If you’re already at Trader Joe’s, you’re within feet of doing much better for not a whole lot more cost. It offers lots of high-quality varieties in the $10 to $15 range, and even a couple of good ones around $5. I pretty much always have the tempranillo or grenache by La Granja lying around, and it sold for $5.99 last time I checked. You’d be surprised how much better a wine you can buy with that extra $4. 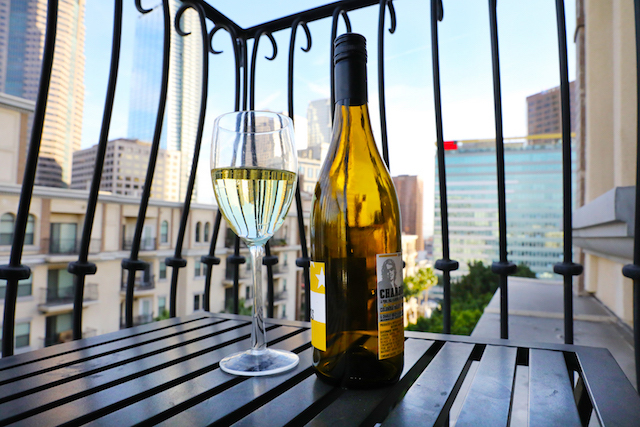 Your Turn: What’s your favorite bottle of wine under $15? Jamie Cattanach is a staff writer at The Penny Hoarder, and holds a Level-III certification from the Wine and Spirits Education Trust. Her writing has also been featured at The Write Life, Nashville Review, Word Riot and elsewhere.